We have a few routine things that we do each day during our line time that I have wanted to share here on the blog. Some of the parents in my class have appreciated the posts I've done about some of the songs we sing. After reading about the songs here, they can initiate a conversation with their child (and maybe a sing-along) about their preschool experience. 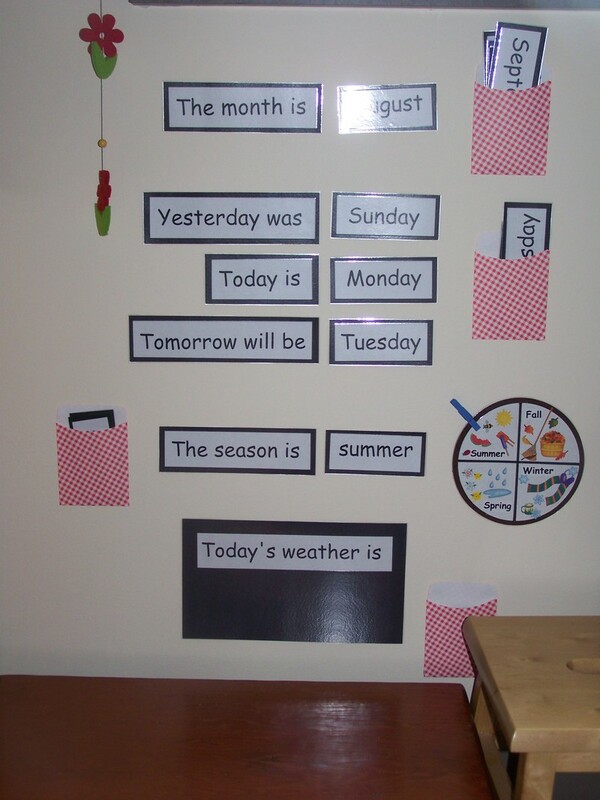 So, I thought it would also be helpful to write about our calendar routine so the parents would be aware of some of the concepts we work on. This is my calendar area which is at the "front" of our line. You can see the red tape of our line in the front of the photo. I leave a space in the line which is where I sit and where the snack helper sits. Everyone else sits on the red line on a black dot. I use a pocket-chart style calendar with plain black numbers. I like this type of calendar because the emphasis is on the numbers instead of a cutesy shape. This allows for fewer distractions for children who are beginning to recognize and see patterns in numbers. The little stool is for my snack helper to stand on when they look out the window to tell us what the weather is. The flag on the shelf is used when we say the Pledge of Allegiance. You can also see the Fudoo board on the floor below the calendar. This is where the snack helper places the magnets for their snack and we discuss the nutritional value of the various food groups. Here is a close-up of the wall next to the calendar. I have the extra months, days of the week and season cards in the little red gingham library pockets. The cards for the weather are in the little pocket next to the weather card. When the seasons change, we will put up the card for the new season and move the clothespin on the wheel to the new season. So........now that you have a visual image of the space, here is what we do. There are 7 days, there are 7 days, there are 7 days in a week (repeat)"
Then we talk about what day of the week it is. I then pull out the number for the date (it is always covered with the blue plastic to stand out on the calendar) and we say the number and the ordinal (i.e. "four" and "fourth"). Then our snack helper stands on the stool and tells us what the weather is and puts up the weather card. Then we all sing "What's the weather, what's the weather, what's the weather right now? (repeat)" to the tune of "My darling Clementine" and the snack helper responds at the end with the weather word (i.e. sunny, cloudy, etc.). Our last consistent step of the calendar routine is to have the snack helper tell what they brought for snack and put up the magnets on the Fudoo board. Then we talk about what group the food(s) are in and what those type of foods do to keep us healthy. After doing the above activities (they only take about 5 minutes), we do other songs/games, etc. Then we go outside for our recess. Thank you for your kind words and the link. I truly appreciate it. 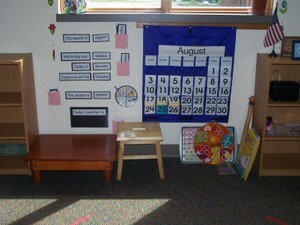 Most of the Montessori materials in my classroom were purchased before I arrived. However, I had ordered fromAlisons Montessori andbeen pretty pleased with their products. Hope that helps! i really like the setup of your calender and ur routine is inspiring. I was thinking about trying to montessori homeschool my daughter as well. I was wondering where u purchased your materials. I am so lost as to which sites are best. If u can help me I would really appreciate it. I always find wonderful inspiration on your blog. You are one of my favorites!